I've known about Seche Vite top coat for a while, but this is my first time trying out their polish. The line was relatively new to Sally Beauty but it's already being discontinued. I picked up this green shade and 7 others on super discount- about $1.85 each down from $9.99. This color is called Charming. The shade is nice but the formula could be better. I found it to be a bit thin and had trouble with it dragging. I have two coats on here and still have a little patchiness at the cuticles where the color pulled away as I brushed over it. 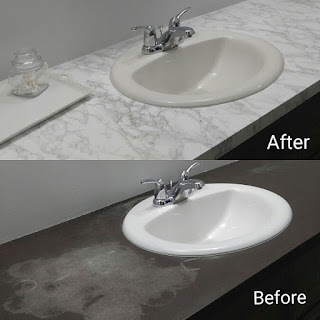 A third coat or waiting longer between coats probably would have helped a lot. For the sale price I'm ok with it but would have been a lot more irked at full price (funny how that works). Have you tried these? If so what did you think? 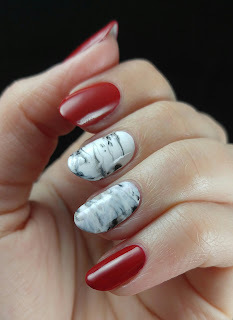 I was seriously considering "Marblous Christmas Nails" as my title for this one. So bad! I need to get more sleep for sure. Even the right hand turned out pretty good. It's been a scary long time..
Hey kids, want to hear a scary story? Shines flashlight on face... It all started about three months ago. I may have mentioned that we embarked on a harrowing journey to find the house of our dreams. Well, we did indeed find a house. The location is almost perfect- close enough to work but far enough away from the neighbors, tall trees, almost enough space to satisfy my hoarding tendencies. But the dream quickly turned to a nightmare when I discovered that the internet doesn't exist here..... Let that sink in for a moment... No. Internet. To be fair we could technically pay twice as much as we were before to get satellite internet with a data cap of 10g per month. Sounds great except the part where I used to use about that much data every day or so. I'm currently attempting my first ever phone only blogging experience. Pros: I'm blogging on the couch! Cons: every single other thing. 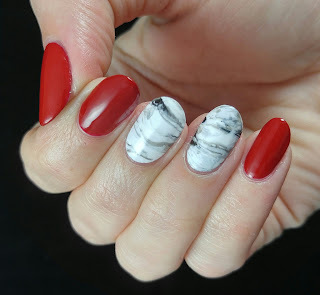 So, I still do nails but it's been really hard to keep blogging. Thanks Google for cancelling the Blogger app for iOS and forcing me to struggle through this mess on my mobile browser. These are my rotting zombie Halloween nails. 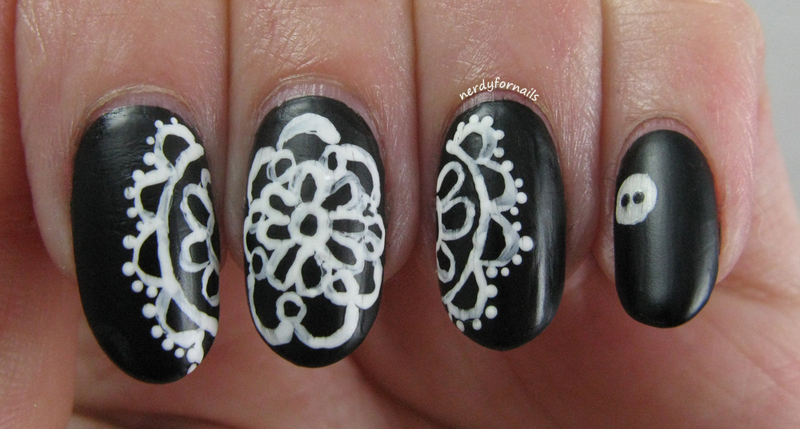 I started with one coat of China Glaze, Don't Get Derailed, then dry-brushed black polish in random places. 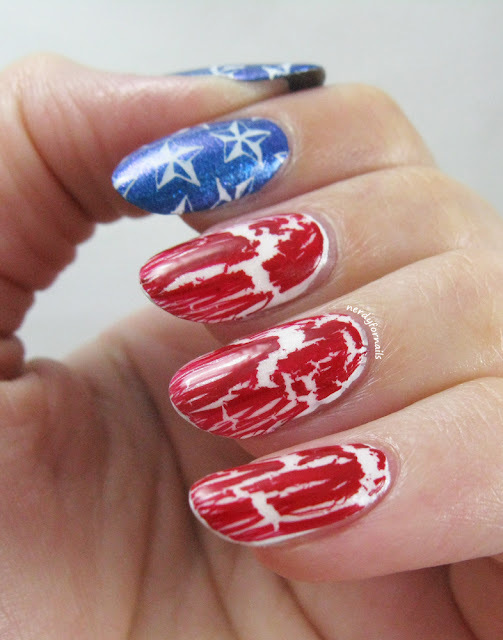 Next I used a q-tip soaked in acetone to rub off layers of polish is a few places on each nail. 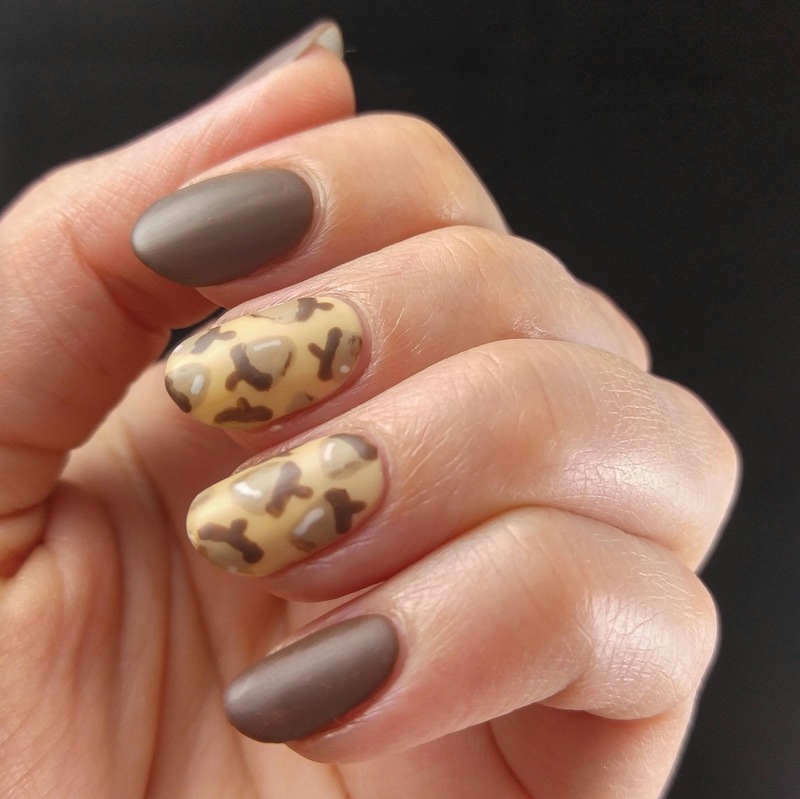 I topped it off with Wet n Wild matte top coat. After that was dry I painted on some blood (Sally Hansen, Brick Wall) and left that part shiny. Any thoughts on this new format? Is the picture quality ok? I can't tell since I'm only seeing it on my tiny phone screen. It's a work in progress, but I'm happy to be back. There are many reasons I wanted to move to Oregon, but the main one: blissfully pretending that the season called Summer doesn't exist. The horrible furnace I came from typically gets to be somewhere near the temperature of the sun starting in April, maybe May if you're lucky, stretching all the way out to October. Today I'm looking out my window at an overcast sky enjoying some low 70's... in the middle of July!!! Do I even need to say how happy I am? 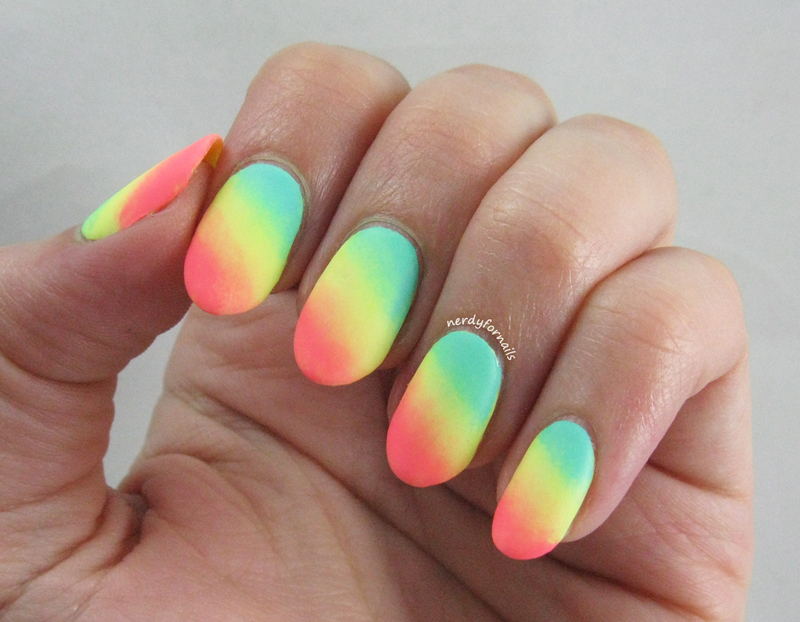 To sympathize with those of you who are stuck in less temperate zones I did some bright summery gradient nails. The matte finish reminds me of a frosty popsicle. 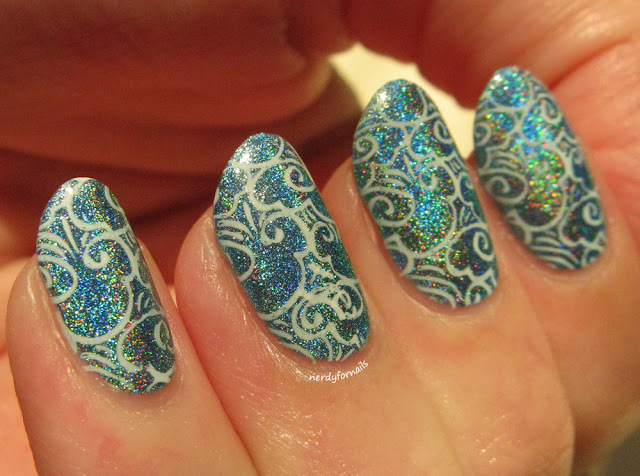 I was originally going to do some stamping over these, but then couldn't bring myself to cover up such a fantastically colored gradient. I started by painting two coats of Orly, Key Lime Twist since this yellow shade was the lightest color in my gradient and I didn't want to mess around with a white base. 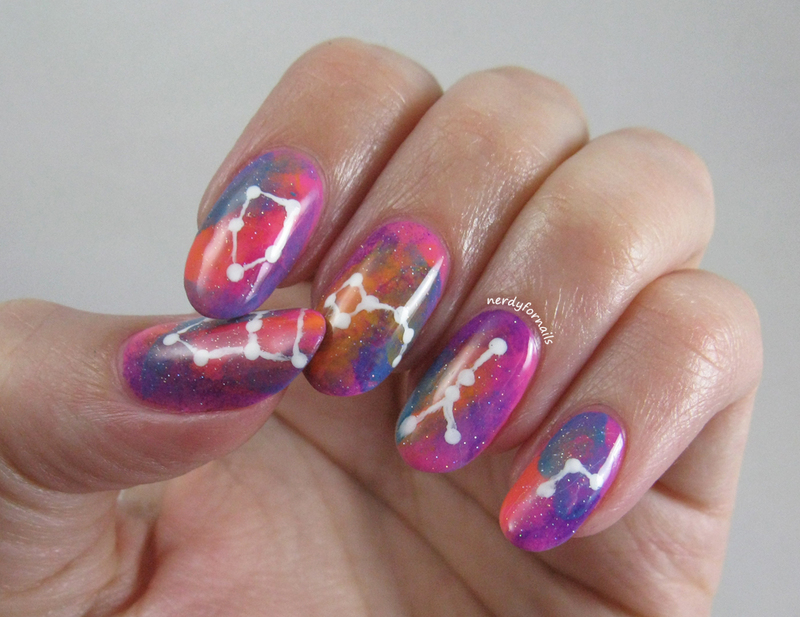 I used a make-up sponge to dab all three colors in a diagonal onto each nail. 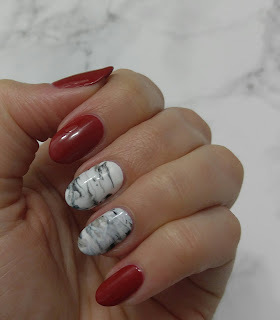 I probably did 3-4 sponged coats per nail. My other two colors are Island Girl, Diamond Head Breeze (the most eye-searing neon pink I own) and China Glaze, Too Yacht to Handle (not sure what neon teal has to do with yachts.. but whatever). The results are a magical unicorn-tail-like gradient. I topped it off with Wet n Wild Matte Top Coat which unfortunately doesn't last as long as a nice glossy top coat. I wish I could have worn these nails all month. I couldn't stop staring at my DayGlo fingers. Meet my sweetest Sugar Glider, Leela. 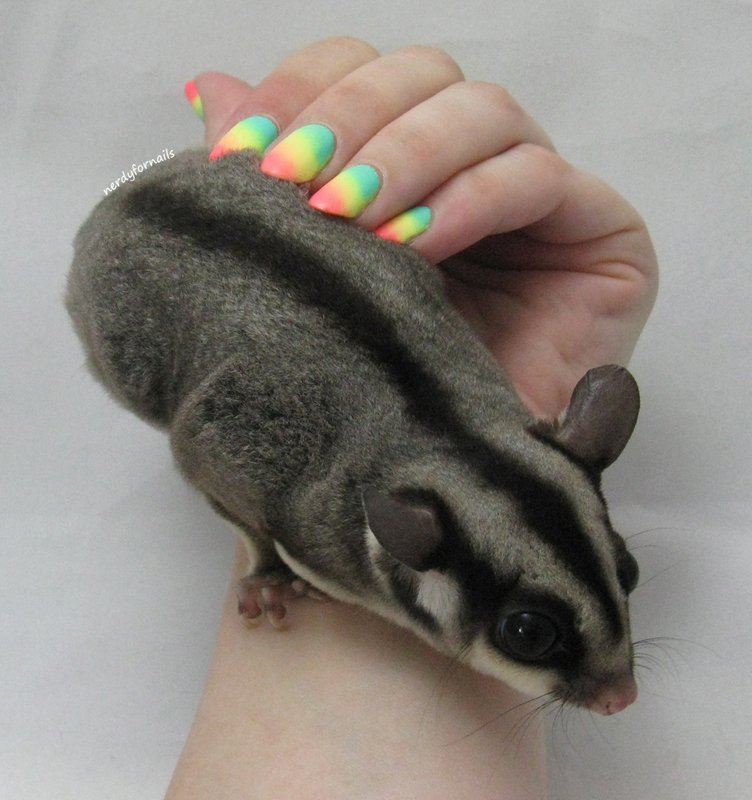 She wasn't cooperating very well, but I'm trying to start a new #MyNailsAndMySugarGlider thing. Her brother Nibbler was too hyperactive and bitey to sit still for any pictures, but I'll try to get some shots of him for you soon. Hello everyone. Today I have a review of the Blush VoxBox from Influenster. All the products in this box were geared toward summer weddings which was lucky because I was the maid of honor in my best friend's wedding in June. 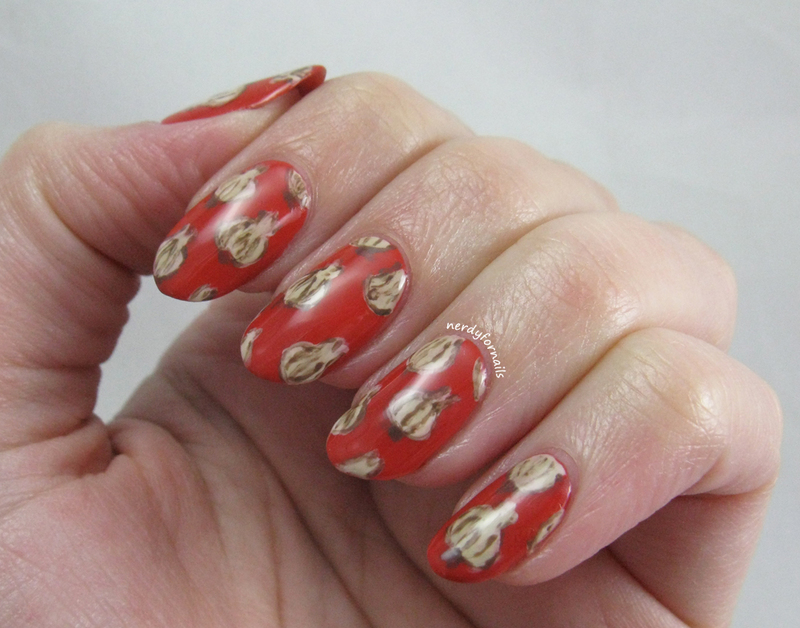 In my next post I'll show you the nails I did to match our dresses. I'll be honest, last month was hectic and I did a crappy job of taking pictures. A lot of this stuff got thrown in my bag and ravenously torn apart in the madness of pre-wedding prep so behold, a bad off-center cell phone picture of the eyelashes from Ardel. 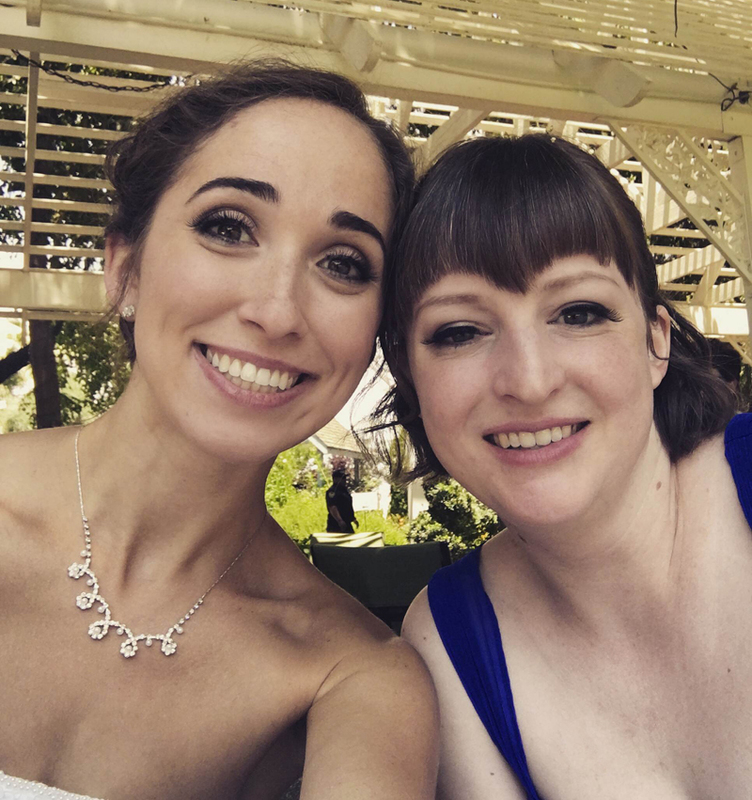 The bride (Kate, left in the picture above) also picked up some Ardel lashes, but the ones she got were a little less full and I think they look a lot more natural. Mine were super dramatic and fun to wear, but I think maybe just a tiny bit too much for me, or at least for this particular occasion. I was also pretty rushed putting them on and not really pro at application in the first place. I wish I'd had about 30 more minutes to get them just perfect. Overall they weren't crazy hard to work with. 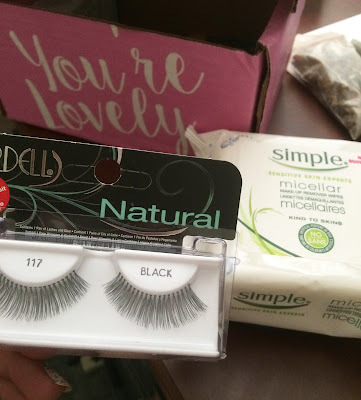 I love the look of fake lashes for dressing up (Halloween, parties, etc) so I'll definitely check out more of Ardel's range of lashes for my next event. 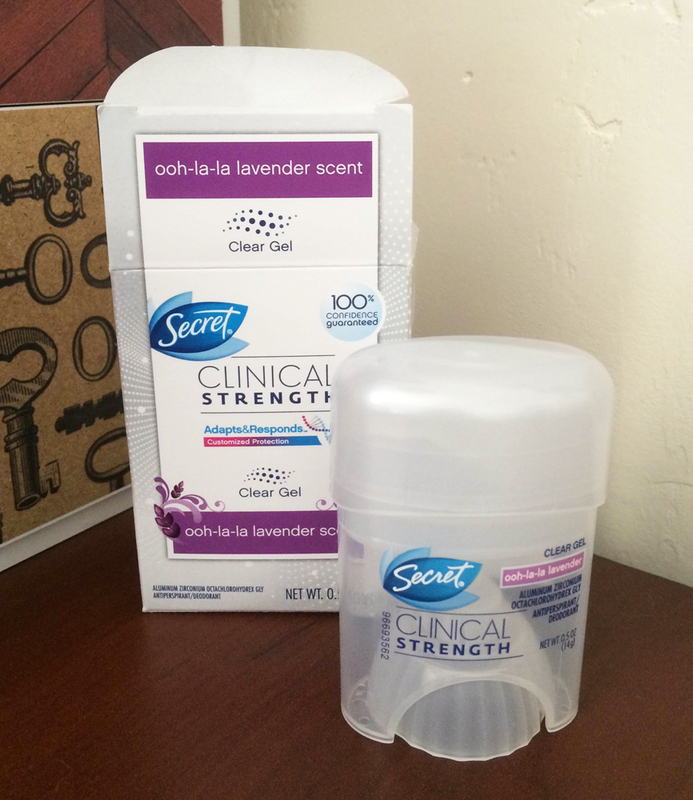 Next up is the Secret Clinical Strength antiperspirant in ooh-la-la lavender. I already use a Secret antiperspirant so I was actually happy to try this one vs the last two deodorant offerings from Influenster. Lavender isn't one of my favorite scents, and I rarely buy scented products anyway, but I'm happy to say this has a very pleasant smell that's not overwhelming at all. This trial size was perfect to throw in my carry-on for the flight. It worked great and kept me smelling good all day even in the summer heat for this outdoor wedding. These Pantene Intense Hydration samples, however, didn't make it into my carry-on. At 3.9 fl oz, that's .9 more than is allowed in the liquids bag. Who am I kidding, I skipped the shampoo and loaded that bag up with nail polish anyway! I did try them once I got back though and am liking them. They smell incredible. Like cookie dough and flowers and unicorn fluff... or something. I can't quite pick out the smells, but it's good. They also give my hair a ton of moisture without weighing it down or making it look oily which can be a problem for my fine hair. Below you can see how much body my bangs have even a half day after washing with this shampoo (conditioner added just to the ends of my hair). 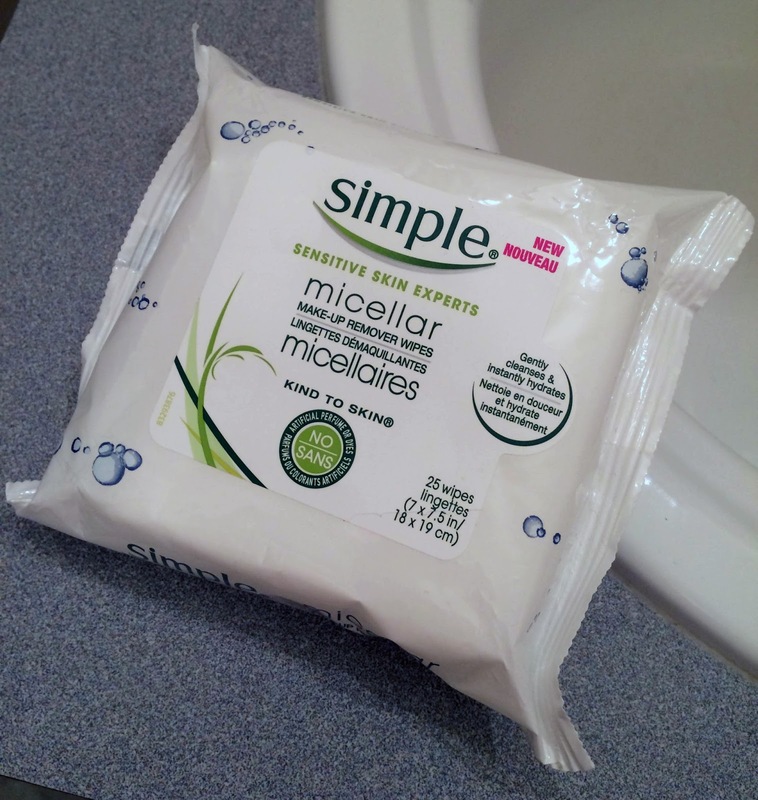 I also got a sample of Micellar Make-up Remover Wipes from Simple. These were great to throw in my bag for the trip since I couldn't take my liquid eye make-up remover. They do a good job getting off foundation, eye shadow and regular eye liner but had some trouble with the waterproof liquid eye liner. I'd recommend these for travel and quick removal of make-up when you're feeling lazy. The wipes were very moist and gentle on my skin. The only thing I didn't like was the residue feeling left over after using them. I'd always plan to give my face a quick rinse afterwards to solve that issue. 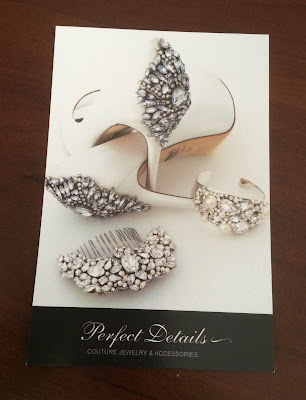 The last thing in the box was a coupon for 15% off accessories at the Perfect Details website. These jeweled accessories really are gorgeous and I did need a clip for my hair, but I received it so close to the wedding that I didn't have time to wait for shipping. This was a great VoxBox overall. I liked all of the products and was able to put them all to good use (except you, Perfect Details). Are there any that you're curious to try? Happy 4th of July weekend! 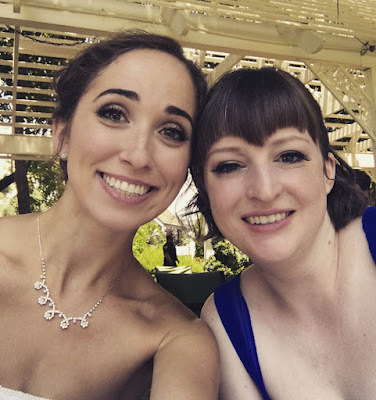 So, I kind of took an unintentional month off from blogging because sometimes life happens like that. We've been house hunting over the last two months and it's been a little bit soul sucking for me. Nothing like looking for houses on a tight budget to show you exactly what your place is in society. I've discovered that my place is manufactured homes from the 70's. But that's ok, because just like my dollar store nail polish budget I'm totally going to rock it and find the perfect (old) place that my husband and I can fix up and call our own. Lucky for me I really like painting. 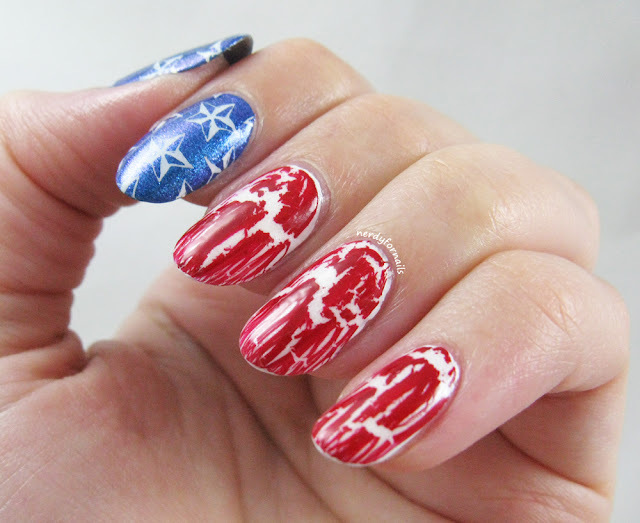 I wanted to do a more abstract flag design instead of the traditional stars and stripes and I've been looking for a fun way to use some crackle polish that's been languishing in the helmer. They turned out so bright and fun and I'm excited to show them off this weekend. I started by painted three fingers with Sinful Colors, Snow Me White. 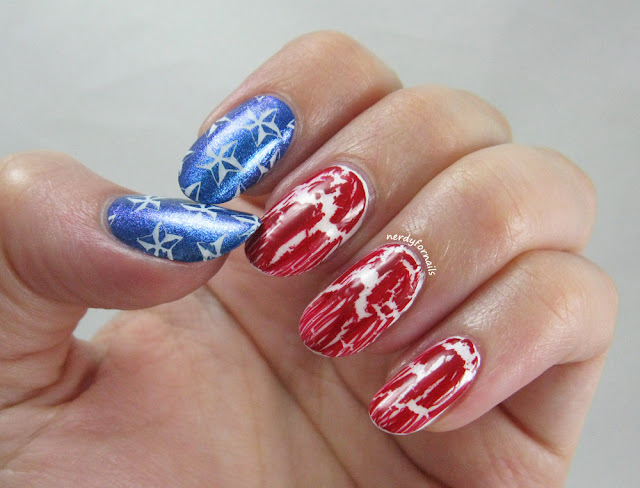 I added two coats of Wet n Wild, Break the Ice to add some shimmer, then topped it off with a coat of red crackle polish that came in a Wet n Wild Fantasy Makers set. The blue nails are two coats of LA Colors, Reckless and one coat of Color Club, Sky High. I used my new clear stamper from Born Pretty to individually place each star image from Bundle Monster plate BM-206 + Mundo de Unas white stamping polish. I don't have any plates with a full nail image of stars so this was a good test of the clear stamper. 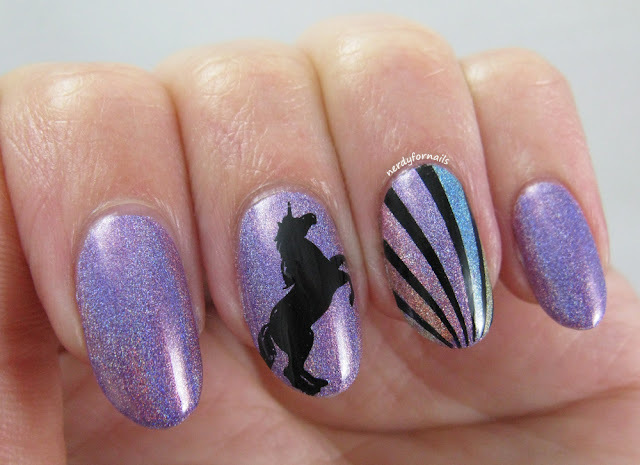 It's finicky actually picking up a full, crisp image, but once I have one on the stamper it's really easy to place it exactly where I want it on the nail. I might keep my eye out for a clear stamper that's slightly stickier, but this one is good enough for the low price of $2 and free shipping on ebay. I had a really bad week and needed something to cheer me up. What can do that job better than a unicorn? 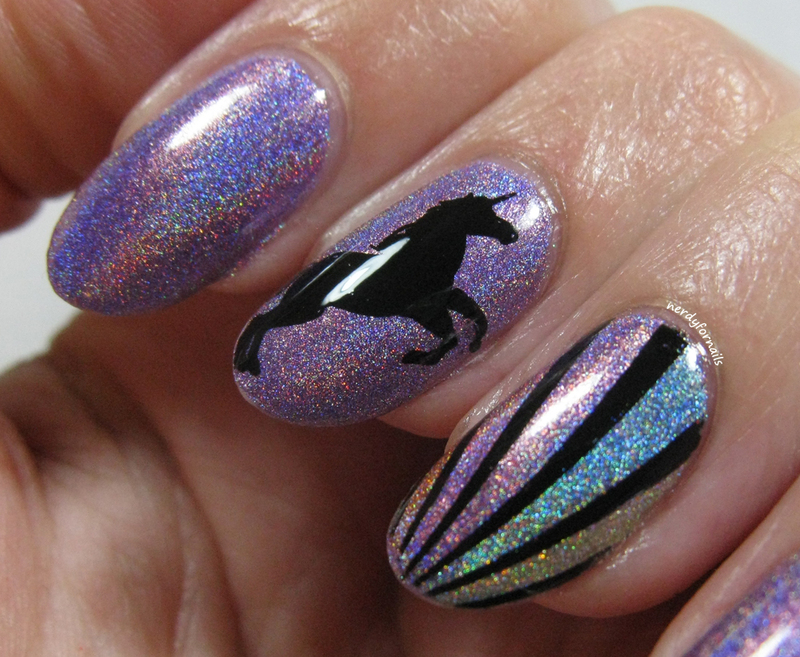 A narwhal or maybe a Pegasus?? It's me though, so pretty much any animal will put me in a better mood, but I was hoping the unicorn would bring a little extra luck along with it. 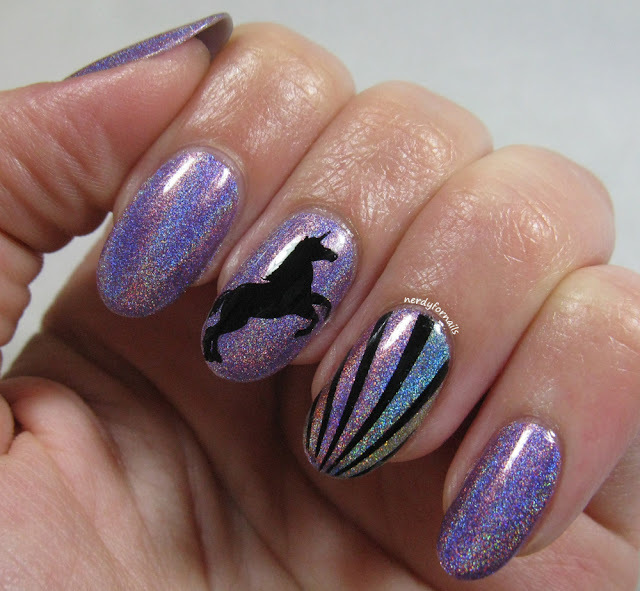 I've done similar nails in the past, but wanted to add holo for even more unicorn magic. Direct light is even more magical. There was no sun to be had this day so you'll have to settle for lamp light. I don't think I'll ever get tired of the Color Club Halo Hues collection. The purple shade is Eternal Beauty. I also used Miss Bliss, Cosmic Fate, Kismet and Over the Moon for my rainbow nail. The flare is really great on these! I used Bundle Monster stamping plates BM-615 and BM-301 for the images and used the decal stamping method to color in the rainbow colors between the lines. I'm not sure if my unicorn has brought me the luck I was looking for, but I'll keep putting out good vibes and hoping for the best. 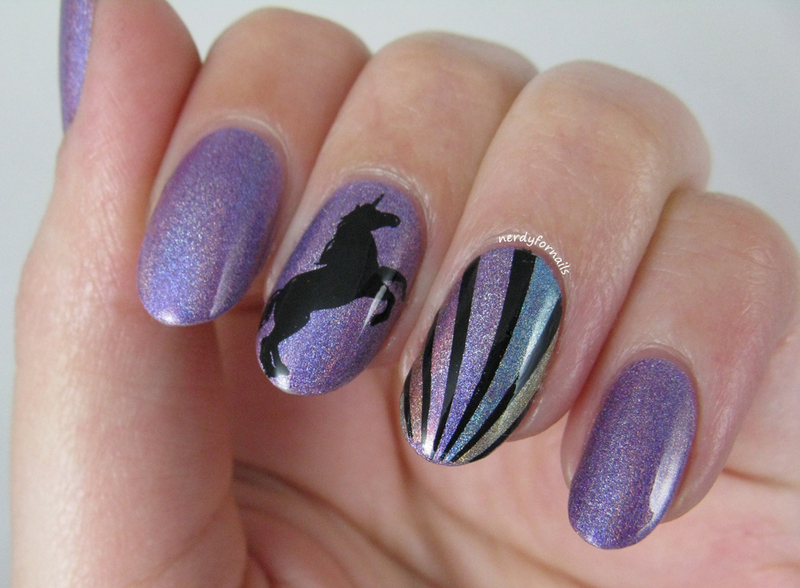 The idea for these nails popped into my head randomly last weekend and I decided to go with it. 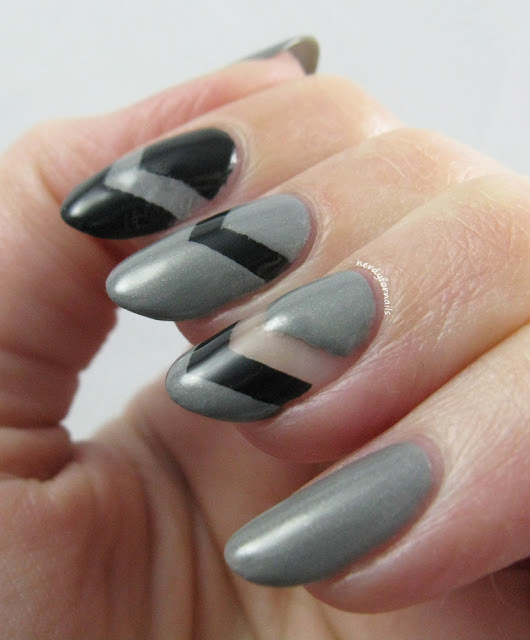 I know it's supposed to be spring but I've been craving grey and black polish lately. Seasons can't define my nail looks! I really love how the negative space nail came out and wish I had done all my nails this way instead of these crazy skittles. 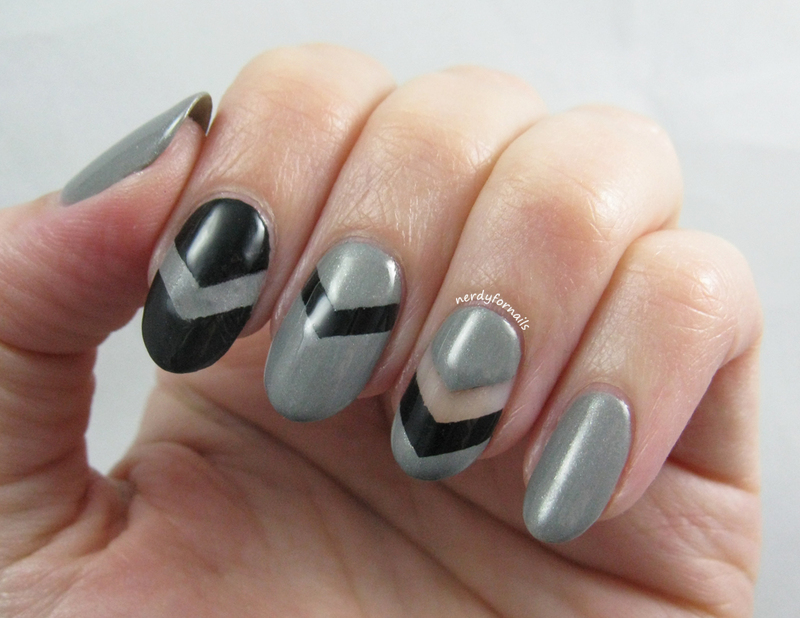 What do you think of this mismatched look? Happy International Astronomy Day. My inspiration today comes from the challenge prompt itself. I loved the swirly nebula colors and wanted to recreate it on my nails. I've always been fascinated by the idea of space and what may be out there. It's crazy how we're able to see objects that are so far away just enough to create more mysteries than we're able to solve. If space travel became a reality in our lifetime I'd be tempted to buy a one way ticket! 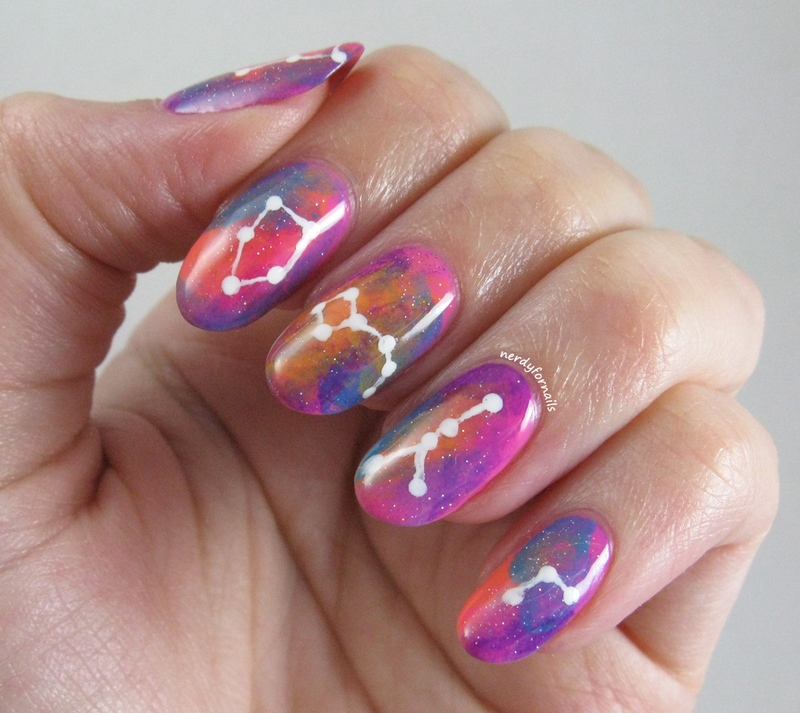 To add to the astronomy theme I've painted some popular constellations on each of my nails. From thumb to pinkie I have Orion, Cepheus, Little Dipper, Cancer and Ares. I sponged on the nebula using bunch of neon colors from the China Glaze Electric Nights Collection- Glow With The Flow, Home Sweet House Music, DJ Blue My Mind and Violet-Vibes as well as Fuzzy Dice from Spoiled. I topped it off with Fairy Dust (probably mandatory for any space manicure) and painted the constellations using a dotting tool for the stars and a small paintbrush to connect the dots. National Garlic Day y'all!! I know I got pretty fake excited over Big Wind Day, but my excitement for Garlic Day is completely genuine. Garlic all the things! Garlic is my absolute favorite seasoning for foods. I put it in everything. Not sweets. That's just weird. 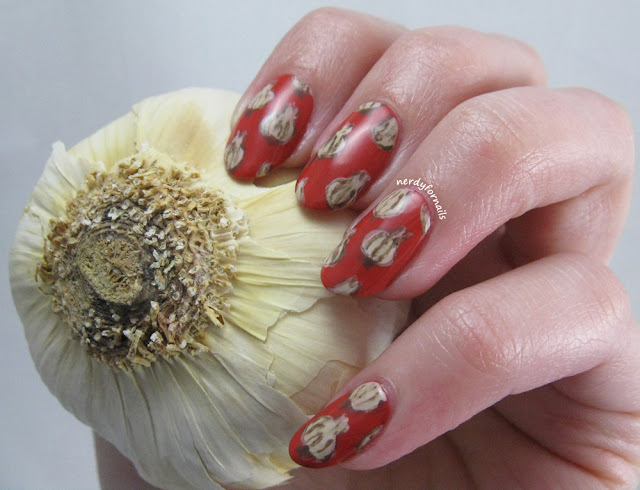 I guess I probably could have stuck garlic cloves to my nails as a jokey manicure for today, but I couldn't waste the precious garlic. 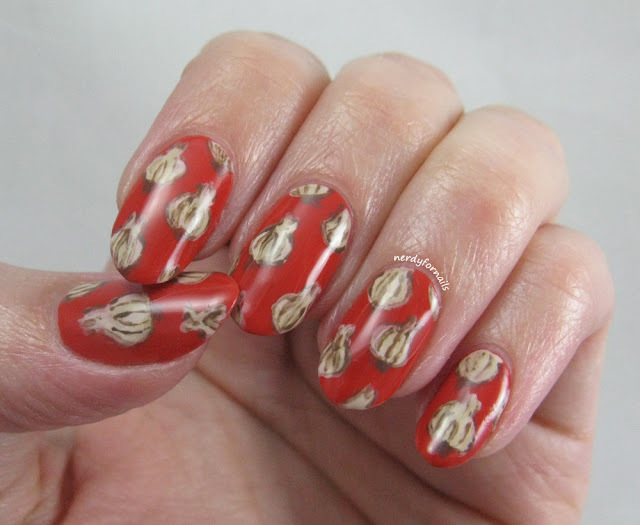 Instead I've painted a cute garlic pattern onto each of my nails. I had to quiz my husband... "Honey, what does this look like?" He looks for a few seconds.. "Umm.... garlic?" he says, with a terrified look like if he's gotten it wrong I'll probably have a meltdown case of nail rage. But of course he's right because every nail design I think up in my head comes out perfectly on my nails the first time every time. Isn't that how it works for every blogger? For my delicious garlic nails I've used China Glaze, Life Preserver as my base. The formula was a little thin and runny on this one, but manageable. I got good opaque coverage in two coats. I hand-painted the garlics with a small nail art brush by layering two tan colors, OPI, My Vampire is Buff and Finger Paints, Don't Make a Scene. I outlined them and drew in the cloves with Spoiled, Pumping Gas. 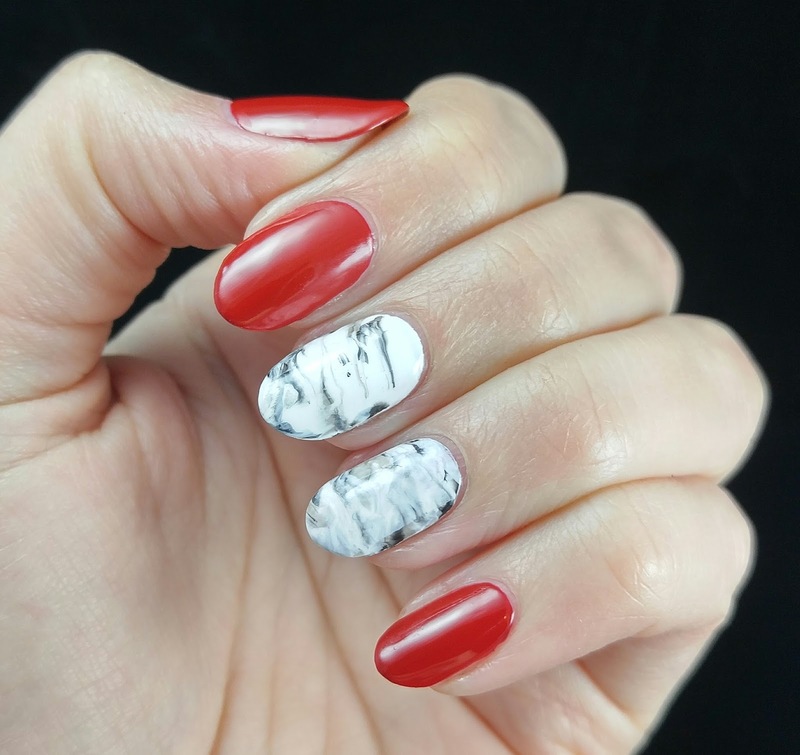 I had just finished painting and was taking the first of my nail pictures when I heard from the kitchen the distinctive sound that is the papery skin being torn off the perfect garlic I'd painstakingly chosen at the store that morning. Nooooooooooo.... I needed that for my pictures!!!! Well, at least the painting went reasonably well. I got a photo with what was left of my magnificent head of garlic and I got to eat it with dinner, so life isn't too bad. Try to contain yourselves... it's the holiday we've been waiting for all year long... National Big Wind Day! According to this totally official looking website Big Wind Day commemorates the highest wind gust ever recorded on Earth's surface, coming in at 231 mph. Wow. This is exciting stuff. Today didn't happen to be a very windy day here so we're not breaking any records this year, but I have high hopes for next April. 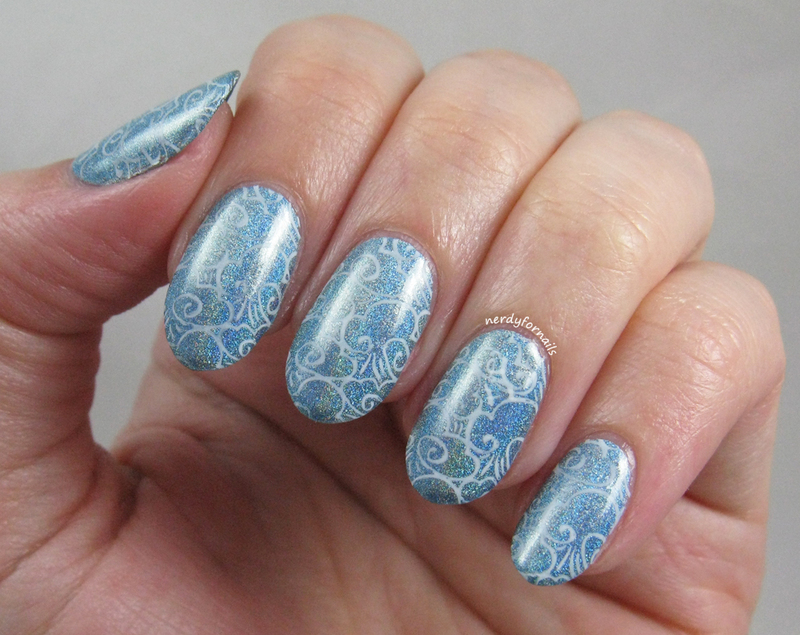 To celebrate I've painted some nails with gusty looking wind inspired stamping. 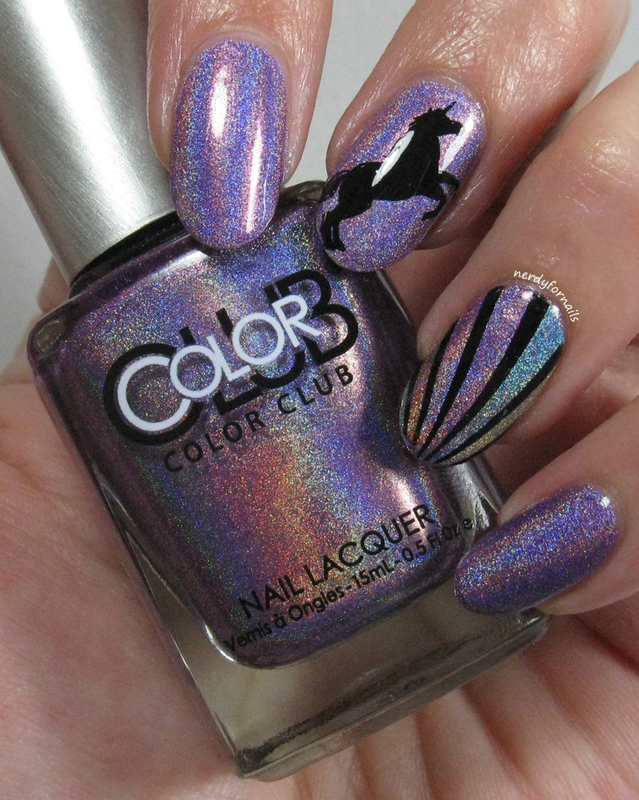 This is two coats of Color Club, Over the Moon. I stamped with Bundle Monster plate BM-312 and Mundo de Unas white stamping polish. Below we have the obligatory holo in the sun photo. Today is National Tartan Day. I had to look it up. This is actually an American holiday celebrating the Scottish Declaration of Independence which our own Declaration was modeled on years later. You can read all about it here. This is a stroke of good luck because I'm going to a Scottish festival with my uncle this weekend. 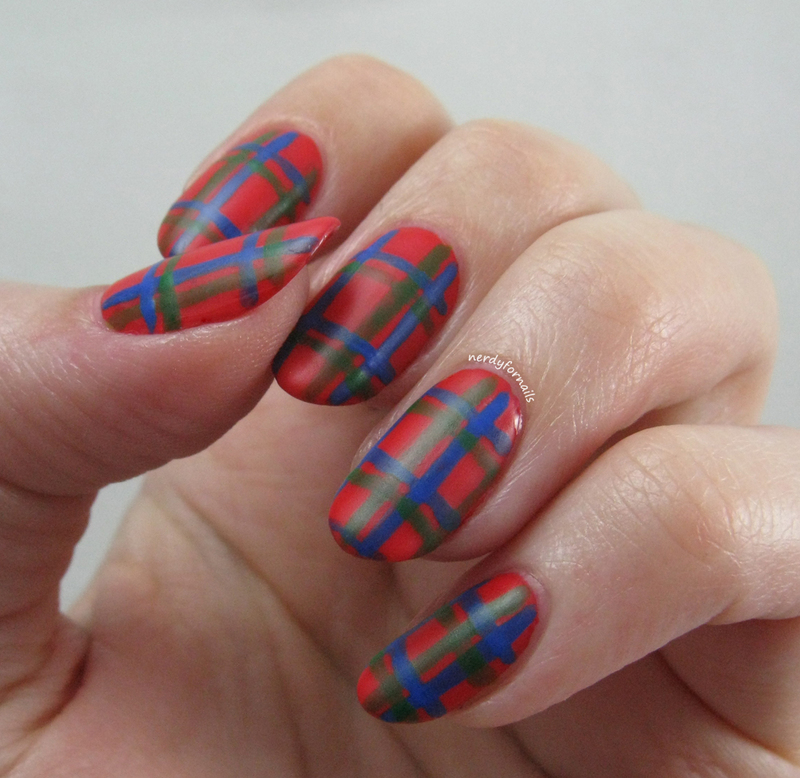 My family comes from Clan Donnachaidh and of course we have our own tartan which I have attempted to paint on my nails. I didn't get a ton of detail in there with my hand painted lines, but the colors are approximately right. 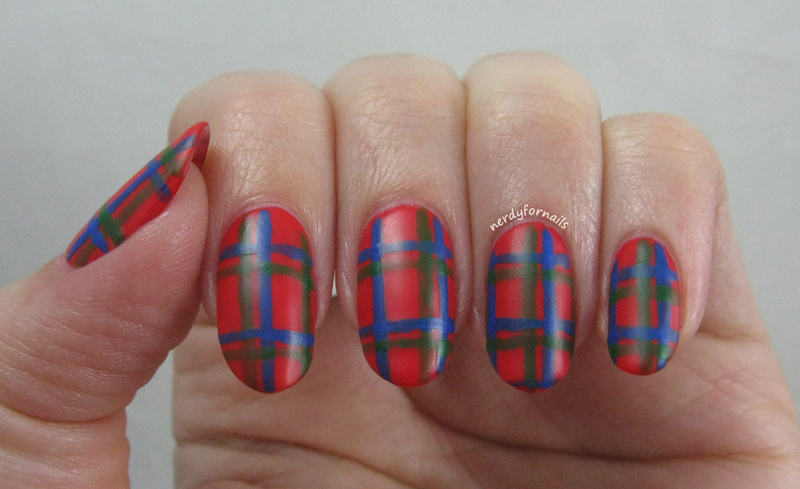 Y'all need to remind me to finally spring for that stamping plate with all the plaid patterns on it. That would have come in really useful for this challenge. 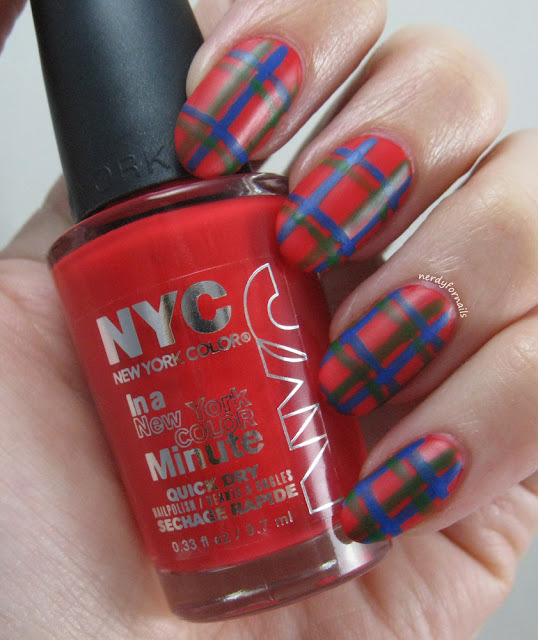 I started with two coats of NYC, Carnival Red. For the green lines I used Spoiled, Permission to Proceed which is a bright green jelly. 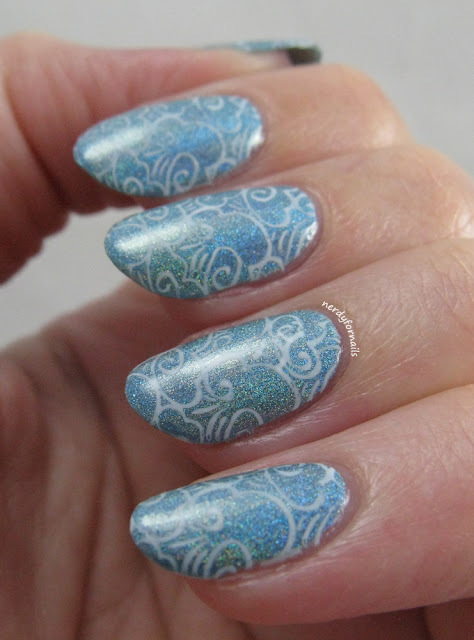 For the blue I diluted Sinful Colors, Endless Blue with some clear polish to make it more jelly-like. 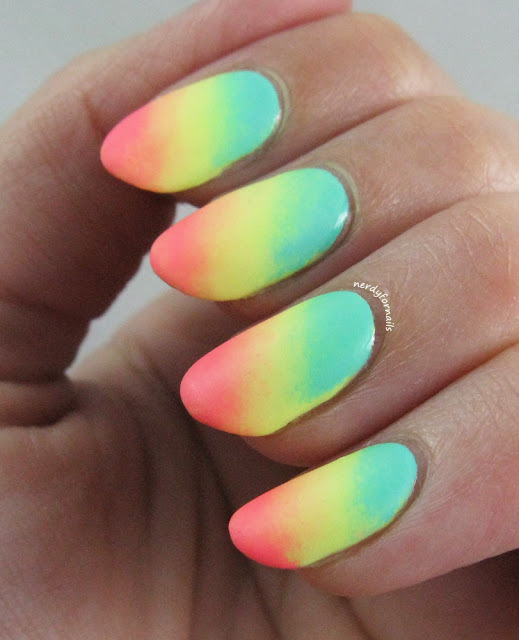 I was hoping the jelly colors would overlap differently giving this look some dimension. It worked better with the green than the blue, but I'm happy with the overall effect. 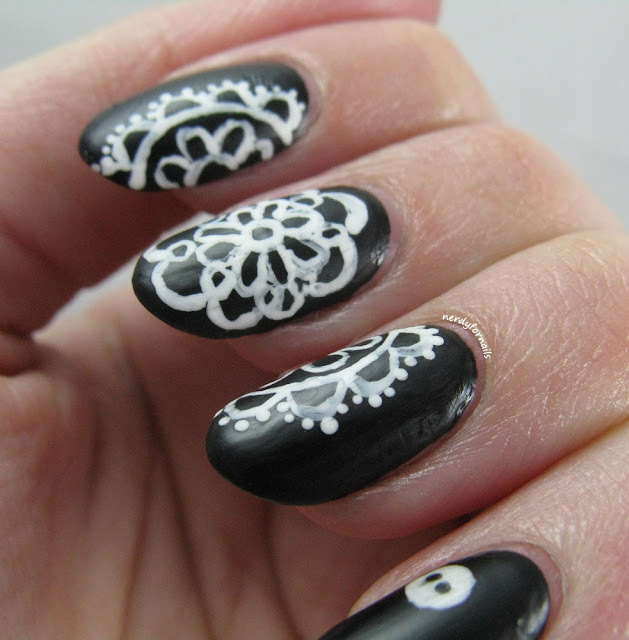 I know, I'm a day late, but I couldn't resist painting some nails for International Tatting Day. Katherine of Procrastinails has put together a really interesting challenge for April. 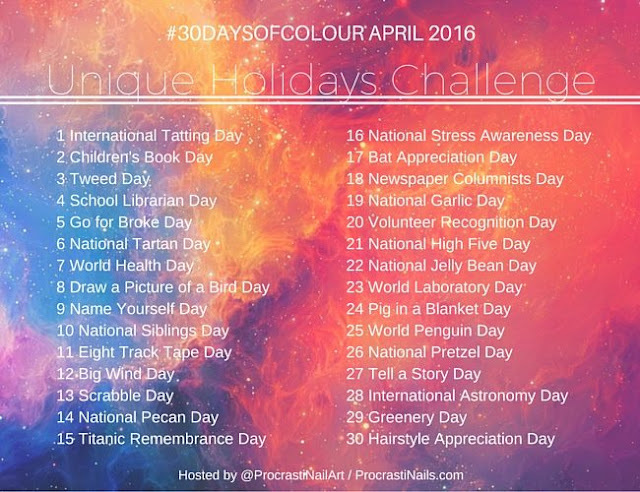 The challenge prompt each day is inspired by a unique holiday during the month of April. If you'd like to join check out the 30 Days of Colour group on Facebook and jump in any time. 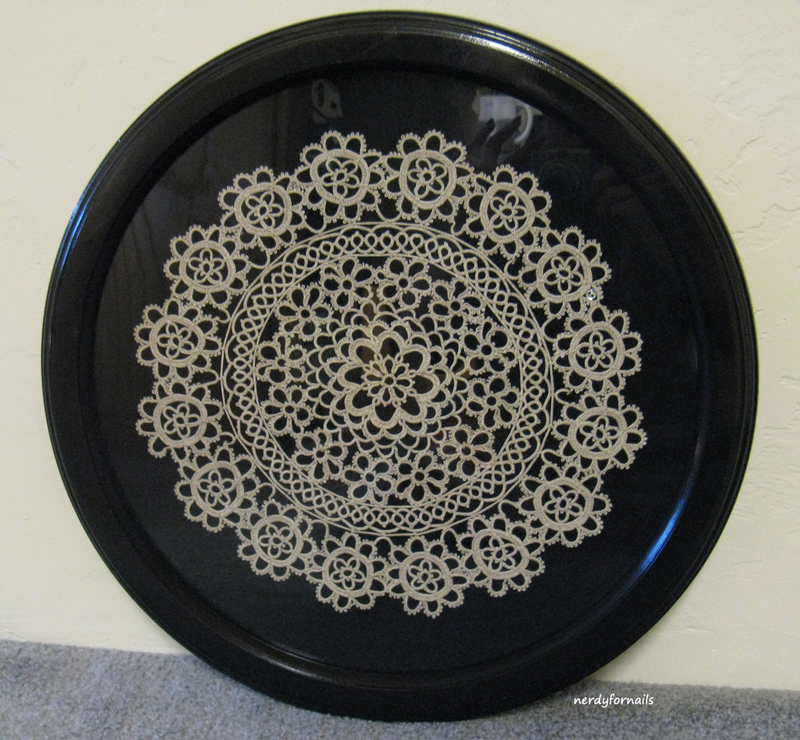 A few years back my grandma found some awesome framed tatting pieces at an estate sale that she thought would be perfect in my apartment. My grandma is hands down the best curator of interesting antiques and home decor, and she was right. I love these tatting pieces. Wikipedia seems ignorant of this fact, but grandma says that each framed piece has to have a button hidden somewhere within the lace. Both pieces she gave me have a tiny hidden button, so there has to be some truth to it. 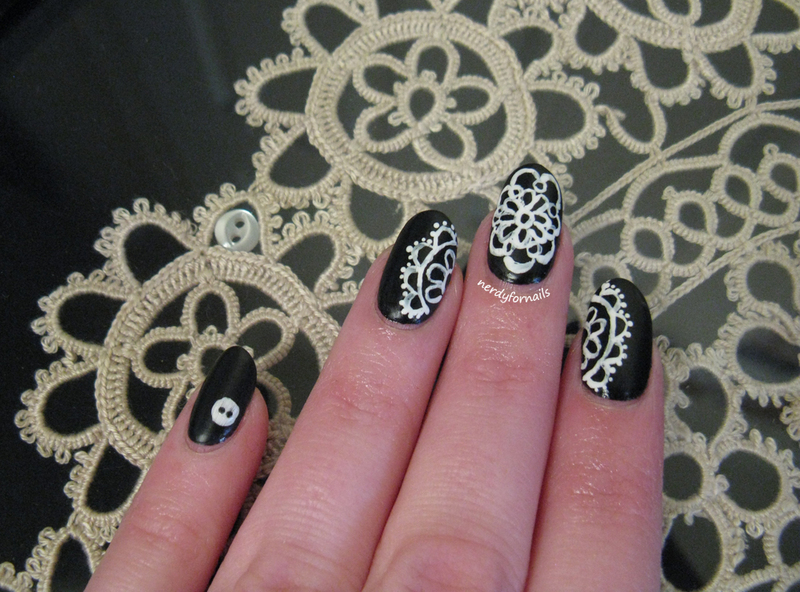 I painted a "hidden" button to go with my tatting nails so they could match. I have another smaller piece that's buried somewhere after the move, but couldn't be bothered to find it. When these pieces came to me they had glossy brown frames and 70's-tastic brown velvet backing. I fixed them up with some new fabric and a can of spray paint to make them a bit more modern and they hung on my wall through three different apartments before we came here. The move was a little overwhelming so not everything got unpacked, but I'm excited to take them out someday and give them their proper place on my wall. For my nails I used Sinful Colors Black on Black and free handed a design similar to my tatting piece with white acrylic paint. 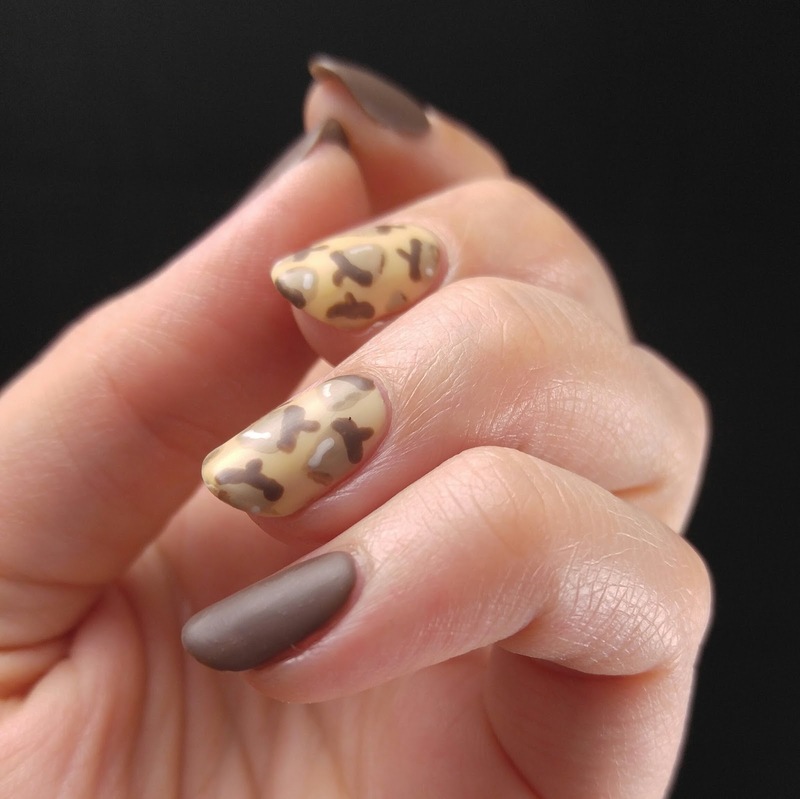 I topped it off with a coat of Wet n Wild Matte Top Coat.